Situated in the heart of Mykonos town, just by the old port, its location is ideal for guests to enjoy the shopping, dining and nightlife for which Mykonos is famous. All rooms and suites have very good amenities including air conditioning and heating, color satellite TV, CD player, mini bar, safe box, direct-dial telephone, modem port, and private bath with hairdryer. The Junior Suites add a Jacuzzi bath, bathrobes and slippers, and designer bathroom toiletries. There are both garden view and sea view rooms and suites. The Harmony’s outdoor swimming pool has an outstanding view of the Aegean and Mykonos Town. There is poolside service from the pool bar, and an elegant indoor lounge as well. The beautifully furnished gourmet restaurant offers excellent cuisine, warm and friendly service, and a superb view of the Aegean Sea. 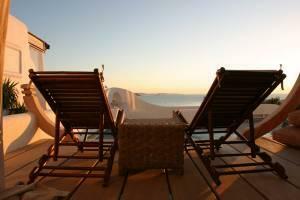 Located in Mykonos Town, near the old port.